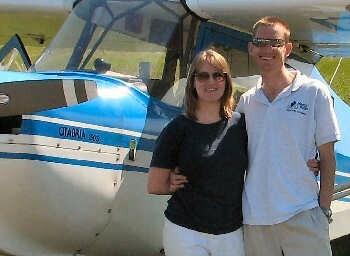 2009: Two ex-Norwich medics who launched a flying doctors charity, Mercy Flyers based in Zambia, are appealing for supporters to come forward and help them keep their lifeline of hope extended. Craig and Rae Oranmore-Brown (pictured right), gave up their medical jobs in Norfolk to fly out to Zambia to set-up the charity and now they appealing for supporters to become a ‘Friend of Craig & Rae’ for a year. We need money for outreaches, equipment, supplies & transport, but the current focus is to secure the presence of the medical team in Zambia for 2010. Drs Craig & Rae Oranmore-Brown, who are connected to Norwich Vineyard church, are using their time the best way they can, but they need your support. Rae is completing essential training on the job at Lusaka Teaching Hospital, working as a surgeon, but receiving no pay. Craig, an experienced consultant anaesthetist, is doing outreaches with collaborators - flying the team and equipment to remote destinations, providing anaesthetic care for the patients who have come for surgery. He is also teaching and speaking at conferences. For more details, or to donate via credit card, contact Sylvia Hemmings or on 01508 536801.